very similar to a deck of mine for trading / stealing mechanics, Tom Cruise Crazy, linked here for ease very nice well rounded deck. I would suggest a couple of odd alternitives for equipment - while it doesn't quite give the same boost (+3/+2 instead of +3/+3), Grafted Wargear equips for , and can be used to get rid of creatures much like the demonmail. Obsidian Battle-Axe will auto-equip to yasovas (go warrior type), and Blackblade Reforged gives a solid boost for legendarys cheaply mid-late game. I hope this helps, keep up the good work! 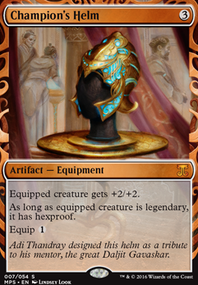 As an additional cost to cast ~, return an artifact card you own in exile to your graveyard. You may cast ~ as if it had flash if it targets a creature that is attacking you. Target creature has base base power and toughness 0/1, loses all abilities and cannot be tapped until end of turn. 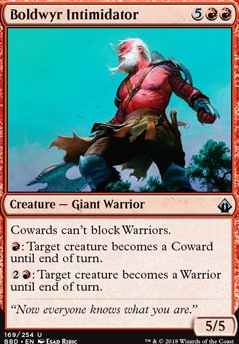 New challenge: Create a card with the Creature subtype "Coward" to oppose the Boldwyr Intimidator, BUT, try to make it good enough to actually see some kind of play. Other Weirds and Wizards you control get +1/+1 and have Haste. Cast five Instants or Sorceries: Take an extra turn. I wasn't sure how to word the ability, so I turned it into an activated ability instead. 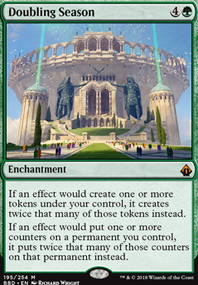 Only kicks in when five spells are cast, which even in Commander will be difficult to pull off without serious build behind it. Would probably get banned rather quick, in my opinion. 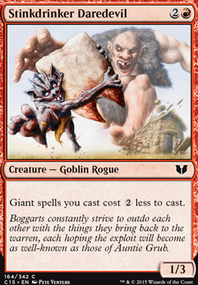 Would be possible with tons of 1 and 2 CMC spells, but you also deplete your hand big time so I don't think it's really that easy to abuse, unless you ALSO incorporate a serious draw engine into it as well. You know Boldwyr Intimidator? Well, make a creature with the Coward subtype. Warriors are fairly aggressive, I would recommend cutting down to 36 lands. Boldwyr Intimidator can help you get through with warriors, Iroas, God of Victory can help too. Lovisa Coldeyes buffs your warriors while giving them haste, and Khenra Charioteer gives them trample (Dakkon Blackblade can be a fun warrior too). Purphoros, God of the Forge can take advantage of the tokens you are making. Ruric Thar, the Unbowed punishes your opponents for playing non creature spells (he can hit you, but it is totally worth it). Nature's Will, Bear Umbra, and Sword of Feast and Famine can help get those extra combat triggers. 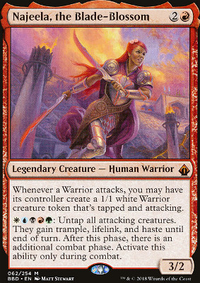 I've made a pretty decent Najeela warrior EDH, there are more cards in the deck that I didn't mention that you might find useful. I would definitely recommend taking a look at my deck, it might give you some more ideas (and it would help me out too ;P). NV_1980 on Warriors, Come Out to Pla-ay! Mardu Woe-Reaper; cheap to cast and gives you some graveyard-hate options. The lifegain helps too. Bramblewood Paragon; nice boost for every warrior you summon from here on out. Stonehoof Chieftain; bit expensive to cast but still a warrior; provides some hefty bonuses for your creatures. Boldwyr Intimidator; this card adds so much flavor to a warrior deck; and it's fun to use as well. 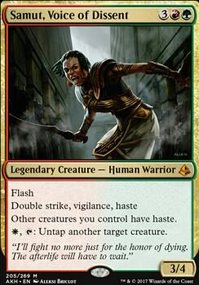 Mardu Strike Leader; fantastic way to swamp the battlefield with warriors. Blood-Chin Fanatic; great way to utilize creatures that were already doomed anyway. Ankle Shanker; turns all your attacking creatures into instant death for anything that dares to block. 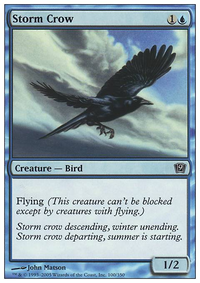 Windstorm; since you do not use any fliers, this can be a great one-sided boardwipe against any players that do. Shared Animosity; since all of your creatures are warriors, this gets out of hand really fast. Raiders' Spoils; fantastic opportunity for some additional card draw. Oketra's Monument; more warrior tokens for you. Hope any of this makes sense. Happy gaming! And should you have the time and inclination, I would appreciate feedback on one of my EDH decks. Thanks. Thanks for the feedback October_Scream! Eldrazi are too mana intensive for my taste, though I find that approach fresh and interesting in comparison to the usual weenies. Boldwyr Intimidator and Briber's Purse and the new Earthshaker Khenra are also very flavorfull and could be a fine starting point when beginning to build a Grenzo deck before working the way for cheaper alternatives with higher levels of repeatableness. Berserkers' Onslaught on the other hand seems like a great addition for almost any level of tuning, and I'll be trying it out once I'm finished testing Scourge of the Throne or find another slot for trying out things. Key to the City is also actually quite nice when considering how little card selection is available for mono red. Mana Geyser is a bit of a sometimes-do-nothing card, but It can still do heavy lifting when your board is empty and opponents always have plenty of tapped lands. I've never had to do it for less than ten for a net of 5 and usually goes towards 20. Very fun card :) I'd love to try out Neheb too if I ever get one. The well thought out part of this deck in my mind is the efficient mana curve and stable amount of enablers (the ceatures and evasion) that come out early so that the deck consistently does what it's made for. I Wish there were more board wipes and removal that fit a token deck in red! It's harsh to wipe your own board and not have much mana to rebuild that turn, luckily Blasphemous act is so good in that regard and I wouldn't even run any of the others. There's also so few ways to beat Elesh Norn without playing 7+ mana cards. Those kinds of things the Unstable Obelisk is here for. I'm lucky to not see her often in my group! When I was building Grenzo I thought the idea of having Eldrazis with Annihilator was a good idea, or Breaker of Armies to make sure you get as many small hitters in. Bane of Bala Ged was also a good add in my head since it's Annihilator but with permanents being exiled. The theme of my deck though was casting small creatures and getting in while the big ones take the blockers or certain spells make the smaller creatures unblockable. Briber's Purse is a maybe for me right now because of the X cost and only available once per turn, but if I had Pia and Kiran in my deck I'd probably keep it since it's another artifact to sacrifice. Earthshaker Khenra is good for early game block prevention, then has more benefits late game when you Eternalize them. There are also some spells that would be best to replace with other spells that give your creatures benefits or more mana rather than a take a creature spell, since that usually can only be used once. Boldwyr Intimidator is a weird late game card for block prevention, but when you have your own ramp, it will be a really good card. The last card I can think of is Key to the City, since it stops a blocker and gets you a card draw if you want it. Berserkers' Onslaught is a really good card for a deck focusing on exiling and taking for yourself. The more unblocked creatures, the more spells to choose from to cast. 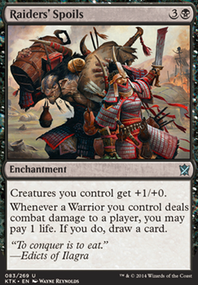 Combat Celebrant is good too for extra combat, and it doesn't need a dethrone ability with an opponent that has more life (though it does have to be exerted, but it's still worth it in my eyes). Battle Hymn may be something you should replace Mana Geyser with since you don't need to spend so much mana or wait for your opponents to become tapped out. Same goes with Neheb, the Eternal, since you're not having to rely on your opponent to help you produce mana. Most of the deck still looks really well thought out though, and I may have to use some of these ideas for my own deck. I originally had Chandra's Ignition and Jaya Ballard, Task Mage as my boardwipe cards, but I forgot Blasphemous Act existed.